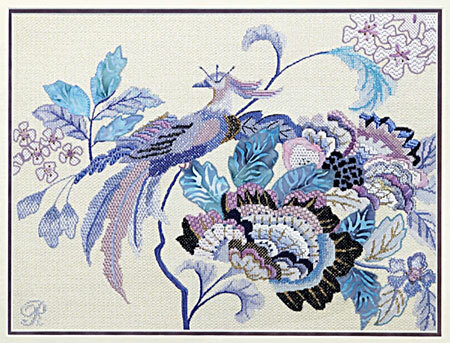 Last year when the issue of Needlepointers came out that featured all the award winners from seminar I fell in love with a piece designed and stitched by Rosalyn Cherry-Soleil. Flight of Fancy. Not only is this piece gorgeous, but it is a tour de force of stitching techniques and innovative ideas. I offered it to you last year as a cyber class and do so again this year. What is most fascinating about this piece is the glimpse into the way a designer’s mind works. Rosalyn interprets painted canvases in a very unique way. On the first page of the stitch guide to Flight of Fancy she admits that she selects her canvas and is at once exhilarated and apprehensive. Can she do this; is it stitch-able? We all face the same challenges. She doesn’t plan the entire piece at one time. Instead she begins with what she knows and the rest will follow. I have been thinking about this statement lately, and while obvious, it is so true. I am currently working on another Strictly Christmas Squatty Santa. The one with cats. Okay, he’s cute, but how to make him fabulous? The stitching santa is fabulous, so I find I do what I know and the rest will follow. It works. He is almost finished. I’ll post his picture next week. You’ll see what I’ve done. I wasn’t sure for a long time that he was really going to be special, but today I decided….he is.